Learn how to curl your hair with a flat iron for a messy look with this Howcast hair tutorial featuring celebrity hairstylist Jacqueline Bush. My name is Jacqueline Bush and I&apos;m an editorial in celebrity hairstyles. My clientele has included Faith Hill, Mark Ruffalo, Terrence Howard, Gwyneth Paltrow, Jane Krakowski. I want to be able to show you that hair isn&apos;t as intimidating or as hard as you think it is and I want you be able to have fun with it and do what your vision is with your hair. I&apos;m now going to show you how to curl your hair with a flat iron. There are a couple of different ways you can do this. The first thing I would do before using any heat product is to use a heat protector in your hair. Especially Monica, she&apos;s blonde, she has very fine hair she has a lot of hair but it is very fine. It needs to be protected otherwise in a few months it&apos;s going to look fried because she has the damage from the color and the damage from the heat styling. So I already ran a heat protector through Monica&apos;s hair. I dried that. There are sprays, there are creams, there are oils you can use all based on your hair texture. I ran a cream through her hair and then I dried it and now I&apos;m going to take a flat iron and show you how to curl it. 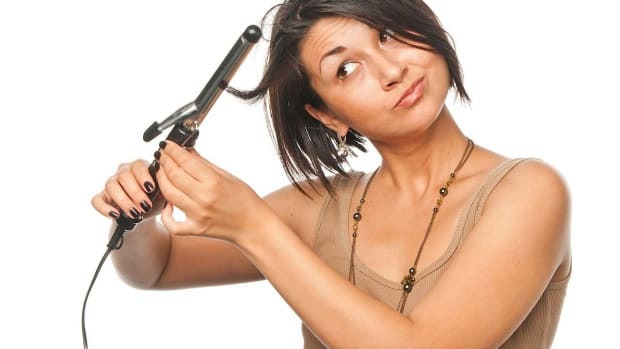 A flat iron is something I would spend money on because if you use a really cheap flatiron, again you get that very frizzy dry looking and you&apos;ll feel it on your hair. It won&apos;t glide through the hair smoothly and the end result will be a frizzy fried mess. That&apos;s exactly what we don&apos;t want. They have flatirons now on the market that have a curved edge, this one doesn&apos;t, and you can curl with a flatiron and make your hair look kind of like that undone, waviness, beach wave that is really popular. The other way is to make it look a little more glamorous and I&apos;m going to show you both. We&apos;re going to do one side of her head one way and the other side the other way. So, I&apos;m going to start at the base of Monica&apos;s hair, we&apos;re going to start with the beach wave. As you can see Monica has a little bit of wave in her hair. I just rough dried it, I didn&apos;t bother taking a brush and making it really smooth because a good quality flatiron is going to do that for me. So the first thing I&apos;m going to do is I&apos;m going to silk the hair, just once, bring it all the way through. That heats up the hair so it can take the next part. Then after I silk it through, I&apos;m going to take the iron and I&apos;m just going to curl the hair and I&apos;m going to take it one more time and curl the hair. Perhaps you just want to do one, just take it through once, not take it through that many times. I&apos;m going to silk the hair and maybe I just want it one time. That gives you a little bend but not a lot. I like to mix these up because if you give every hair the same amount of curl that&apos;s when it starts looking like you got it styled instead of your hair naturally being wavy. Say for example I dunt the hair, say I left it on too long, let&apos;s say I leave this piece now I take my iron through, see I&apos;m wrapping it, figure I&apos;ll just leave that. As you can see that&apos;s a little bit bumpy, you get this, if you can see that kind of crimp in the hair. Well don&apos;t worry, you can fix it, this is the beauty, you haven&apos;t gone too far, just take that iron, silk it again through, this time you want to pull the hair with a little more tension. The reason you&apos;re doing that, you want to pull that crimp out of your hair. Now I&apos;m back to the beginning, The hair is hot enough that it is taking the heat and I&apos;m going to wrap it and as you see I&apos;m opening and closing the iron so that I won&apos;t get the dent marks. Now another good thing or trick to start out with if it is your first time is to start in the back of the hair, so that way if you mess up it&apos;s in the back and underneath. I f you mess up nobody sees it and by the time you get to the top hopefully you&apos;ll become proficient enough into it. Now for Monica&apos;s bangs, she&apos;s got bangs in here that hit about at her eye level. I really don&apos;t want those to be curled, just a little bit of a bend. So as you saw with my iron I&apos;m just taking it and smoothing it through and curling it a little. So I take it, smooth it through and curl it a little. If I take it, smooth it through and make it straight, there&apos;s not going to be a bend and as the camera will show, will show the difference between this piece and see how that piece is completely straight. So to fix this piece I&apos;m going to take the end, I&apos;m going to curl it in the opposite direction, like how we saw in How to Style Long Layered Hair. It looks very natural is if you do different directions. Now that we have styled this side of the hair, I&apos;m going to let the heat cool. If you start running your fingers through the hair before the heat has finished cooling off, all that curl is going to drop, and you&apos;re going to lose what curl you just put into the hair.